Two months ago, just before the local government elections, a disabled, wheelchair-bound couple who are looked after by their 12-year-old son were promised a house by Minister of Women, Children and People with Disabilities Lulu Xingwana. But on Tuesday the couple, who live in a one-roomed shack in Khayelitsha’s YAB informal settlement, heard that they might have to wait years for their promised house to become reality. 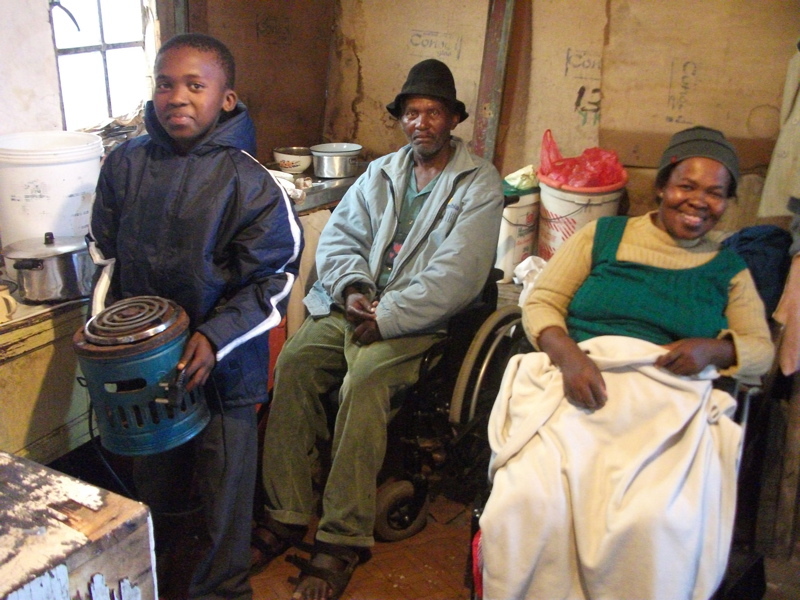 After West Cape News highlighted the story of 12-year-old Ntsikelelo Bharhu who cares for his disabled parents Nceba Kwinana and Nomzamo Bharhu in the Daily Sun on March 16, Xingwana visited their tiny shack on May 16. She was accompanied by TV, radio and newspaper journalists and promised to move the couple to a newly built house. The next day – a day before local government elections – in a surprise visit to Khayelitsha accompanied by Deputy President Kgalema Motlanthe, about 200 people heard her again commit to helping the family move out of their shack. On Tuesday this week a representative from Xingwana’s department, Nonkosi Tyolwana, visited the family. But expectations that the shiny black cars outside the families home meant she was to announce a new home for Ntsikelelo Bharhu and his parents were crushed. Tyolwana told them the promised house might take “a year or two” to materialize. Tyolwana said the department was going to look at other options, like getting the family a temporary house. The announcement has angered community leaders and residents who accuse Xingwana of creating false expectations. Some of the residents said on Tuesday they thought the time had come for the family to be moved and were disappointed when they discovered the truth. Nceba Kwinana, 62, said he got a call from Pretoria last Friday telling him that government officials would be visiting this week. “I was so happy when I get a call that people who promised us a house were coming to visit us. All I was waiting for was good news that we will get the house, but it seems we’re in for a long wait,” said Kwinana after the official visit. He said when Xingwana first made her promise she made it sound like they would have a new house “within that week”. “I also heard on radio the woman (Xingwana) explaining about our situation and that her department would help. It saddens me that nothing has been done,” said Kwinana. “We thought the visit by Xingwana meant the struggles were over for the family and they would be taken care of, but we were wrong,” said local community leader Unathi Mabengwana. “Their house is leaking and water comes in. Yesterday’s visit from minister’s department was pathetic and it left residents more furious,” he said. Responding to questions last week, Xingwana’s advisor David Dlali said Xingwana was in discussions with the relevant department on how to assist the family. The family survives on disability pensions but spend most of their income on hiring a car to take them to the payout point each month.